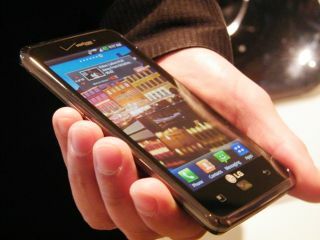 LG announced at CES 2012 its latest Android smartphone which not only takes on the iPhone when it comes to screen quality but also trumps it. Called the LG Spectrum, the smartphone has a 4.5-inch screen which has been given an HD IPS display with a pixel density greater than the iPhone. It's powered by a 1.5GHz dual-core processor and as it is coming out in the US is also uses LTE – so high-quality video streaming looks great on the device and comes without buffering. We were given a demo of the device – unfortunately LG wouldn't give us any one-on-one time with the phone – and it gave us a decent idea of just how well the phone streams content. It's fair to say that we were impressed with what we saw. This is because the phone comes pre-loaded with ESPN SportsCenter app – an app which has always been a favourite at TechRadar towers. And now it's even better as it can now offer a 720p live stream to users, something the LG Spectrum handled effortlessly. This looked great on the LG Spectrum's screen, the display pinged with quality and even though we were in what is essentially a Las Vegas basement, the stream didn't judder and you couldn't see any pixelation in the picture. In fact, once you lock your eyes onto the LG Spectrum's 4.5-inch IPS display you don't want to look away. The extra pixels – 329 pixels per inch – isn't that much more than the iPhone 4S' 326 pixels an inch but the quality is fantastic. And as it is IPS, LG reckons it will give you more bang for your buck when it comes to battery life. On the slight downside, the handset we looked at was only Android 2.3.5 (Gingerbread) but LG assured us that Ice Cream Sandwich was on the way. Add to that the fact it's a little bit on the chunky side (especially when compared to an iPhone) and you can see what selling point LG is going for here. Flip the phone over and LG has added a decent 8MP camera to the LG Spectrum and also given the back a nice checkered look. If you want to do a bit of front-facing videoing then there is also a 1.3MP camera on the front. But if you do that then you have to stare at the garish logos plastered on the front of the LG Spectrum. Verizon really do want you to know that it has exclusivity. The LG Spectrum release date is 19 January and the phone is only for the US at the moment. The phone is exclusive to Verizon and will be available for $199.99 with a 24-month contract.